Martin Schmidt’s Mainz edged Gladbach in quite a close 1-0 win which highlighted the attacking issues that Schubert’s side is faced with. In the first phase of build-up, Gladbach were quite focused on developing a 3v2 overload against Muto and Malli in Mainz’s 4-4-2 press. They looked to achieve this in two manners, though both involved a 3-chain being created as Christensen and Hinteregger split into their respective half-spaces. Especially early on we saw quite an active Yann Sommer in the Gladbach goal as the Swiss goalkeeper would involve himself in build-up quite often. As the centre-backs would shift towards the flanks, he would situationally move up slightly higher to form a chain of 3 and support the circulation across the back. Although obviously he was rarely a direct outlet in build-up, he supported the two centre-backs by creating a 3v2 in the first line. This would often free one of the centre-backs in a half-space to then progress the ball forward and work around the Mainz press. An added benefit of this was that it supported Gladbach’s occupation of the centre. Without the responsibility of dropping to form the 3-man chain across the first line, Nordtveit could play slightly higher up and potentially offer for passes into the centre of the pitch. Alternatively, and through the game more commonly, it was Havard Nordtveit who would create the 3-chain in the defence by dropping between the centre-backs. In doing so he was rarely covered by the Mainz midfield and would, like Sommer, allow the centre-backs to move into their respective half-spaces and possibly be free during build-up. 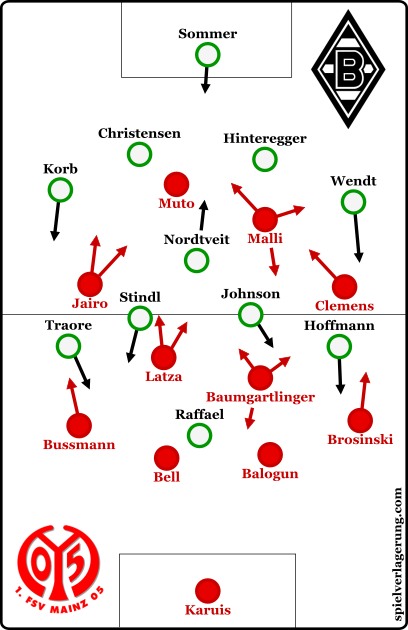 However with Nordtveit in the defensive line, Gladbach’s connections into the midfield suffered to an extent as Stindl and Johnson could be quite distanced from their defensive midfielder at times. This lead to quite a few long flat passes from the 1st line of players into the midfield which, albeit were completed, were very difficult to control which made it difficult for Gladbach to then maintain possession from this moment. As a result Gladbach’s efforts in the final third, which were already struggling, suffered further as they struggled to develop sustainable access into the centre. In the opposition half, Gladbach struggled to create chances and progressively became more wing-oriented in their attacks as the game developed. Throughout the clash, the majority of their attacks were limited to spaces down the wings which possessed minimal potential as they struggled to develop access into the centre of the pitch. Obviously, credit must be given to a Mainz side who were impressive in defence, though Gladbach showed clear weaknesses down the middle. The Foals were never really able to integrate Raffael into their attacks, as they struggled to get him involved in the central attacks whilst neither Stindl nor Johnson had a telling influence either. Meanwhile in wide areas, both Traoré and Hoffmann weren’t able to have a positive impact on the attacks down the middle and were generally limited to the wider areas. Under Schubert, Gladbach have become a much more man-oriented defence as opposed to their position-oriented scheme which was key to their success under Lucien Favre. Across the team, the players will move quite far away from their original positions to follow their man and apply pressure with better defensive access. As in their defeat to Dortmund, this aspect of their defence also played an important role in their match against Mainz on Friday night. One of the key aspects of their pressing in the first game of the Rückrunde was how they frequently left Ilkay Gündogan, one of the best 8s in the world, open in the right half-space. Ultimately this was pivotal in the match as he received the ball from Bürki to then assist Reus in the opener of the match. Interestingly, there were a number of cases throughout their game in Mainz where this also occurred. As both Johnson and Stindl would move higher to press the Mainz midfielders, spaces either side of Havard Nordtveit would open up, particularly on his left where Hoffmann was covering Brosinski. In Yunus Malli, Schmidt had a very strong player to exploit this and the number 10 would usually shift into these open gaps in the hopes to receive a pass as a free player. Although this did not lead to goal as it did on Sunday, the holes were clear to see in Gladbach’s defence and it will be intriguing to see if this gap remains as the weeks progress. On the other side, Martin Schmidt’s Mainz also utilised a man-oriented defence however it was much less strict than their opposition. It would be a rare sight to see the players move far out of their position to cover a man and they would maintain their 4-4-2 shape more clearly than Gladbach and their 4-1-4-1. Generally they would look to cover their man once he got within a relatively close distance but to less of an extent than Gladbach in defence. In their pressing, both Malli and Muto were relatively effective in blocking the passes into midfield with somewhat of a focus on restricting their use of Nordtveit. Following this, they both displayed good backwards-pressing to maintain pressure on the ball after their line had been beaten by Gladbach. This was particularly evident with Malli whose intelligence could be seen quite well. The two wingers acted quite narrowly out of possession and worked well to support the central pressure and in some cases support the two forwards higher up. Their support within their own half was crucial however as they contributed to a strong level of compactness which was crucial in limiting Gladbach’s chances throughout the match. Schmidt’s side often appeared in a clear 4-4-2 with minimal space to exploit within the 10 space. Although more rare, it could be seen that the wingers would join the defensive line when Gladbach decided to introduce an increased number of players into the attack. The 4-4-2 beats the 4-1-4-1 formation, who would’ve thought it? This match was a prime example of how the formation is quite irrelevant in contrast to the team’s orientation and their execution on the pitch. Mainz were able to overcome Gladbach by their strong defensive performance with impressive compactness, whilst Gladbach struggled to develop access into the 10 space with the ball.